Whether you're hauling bikes for the entire family, conquering the race circuit with your team, offering educational programs, or operating a mountain bike shuttle service, Huckwagons has you covered. With Huckwagons versatile rack and trailer design, bikes are transported scratch free, cradled rubber side down, and secured with our simple hoop-tie down mechanism for quick and easy loading and unloading. Huckwagons mountain bike trailers offer a smooth highway drive and are capable on even the most rugged terrain. WHICH TRAILER IS BEST FOR YOU? Every trailer is purpose-built and hand-crafted in the Pacific Northwest. Check out our wide range of trailers along with our standard features and options. Then, contact us today to get your order started. Thank you for your order request! We will contact you shortly to begin the your order process. We're excited ... are you excited?! Even the smallest Huckwagons trailers help make trips to the trailhead more fun with available features like our cargo area so you can stash your stuff outside of the car. Small trailers hold from 6 to 8 bikes or a combination of bikes, canoes, kayaks, paddle-boards or basically any adventure sport gear. Requirements include a 750 lb towing capacity, 2 inch ball hitch and wiring system for a trailer. Each Huckwagons mountain bike trailer is customizable to fit bikes, kayaks, canoes, paddle-boards or equipment for practically any adventure sport you and your crew are into. Medium trailers hold from 10 to 14 bikes. Your vehicle must have a 1500 lb towing capacity, 2 inch ball hitch and wiring system for a trailer. For the biggest mountain bike expeditions, there is no better way to haul a massive amount of bikes and gear securely than with a custom built Huckwagons rack. Large trailers hold from 16 to 24 bikes. Requirements include a 2500 lb towing capacity, 2 inch ball hitch and wiring system for a trailer. Your vehicle may also need additional wiring for brakes. Have a question about which size is right for you? Drop us an email and let’s get the conversation started. Once the order is finalized and timeline set, a 50% deposit is needed before fabrication. A final proposal will be sent listing the agreed upon terms and features of the trailer. Building time frame and delivery fluctuate seasonally. Let's get started building what you need well in advance. 5. Again, have a question? Contact us. 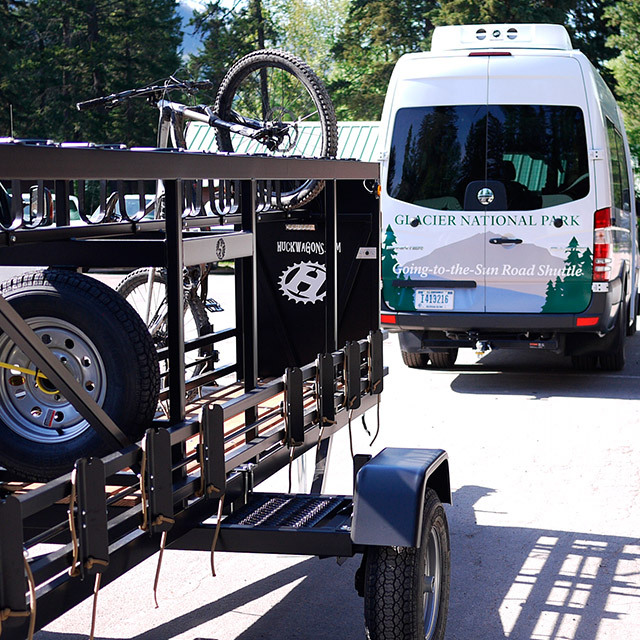 Huckwagons is proud to be selected as the bike trailer of choice by the Glacier National Park Conservancy. Check us out on Instagram to view more happy Huckwagons customers and see the wide variety of bike trailer and shuttle options available. Like us on Facebook to keep up with Huckwagons and see our latest innovative custom trailer solutions and mountain bike rack designs. Our mission is to spread the joy of the outdoors by sharing our passion for mountain biking with you. Our innovative design brings biking and the great outdoors to more people. A simple solution driven design to transport your quiver of bikes and adventure equipment to adventure destinations. We love mountain biking and especially sharing it with friends. Whether it be shuttle rides to the trail head, the hike and bike up the hill, or the PBRs® after the ride...the camaraderie is what makes the experience complete. Started out of necessity for a blended family and as a shuttle rig for friends, Huckwagons has become a way for Heidi and Gary to share their passion for biking, community, and drinking good beer. Always ready for a road trip, they transported gear, people, and dogs countless times…creating fond memories and unimaginable smells in a crowded party van. At full capacity (or more), their rig hauled people and stinky gear up fire roads, across international borders, and over pristine mountain passes. Why? Just because. Until one day, when everything changed. An ad for racks in a bike magazine said, "Take more friends.” Gary’s answer? "Why not take them all?" It was that infamous “Ah ha” moment and Huckwagons was born. Purpose built, handcrafted in the foothills of Washington's Cascades, Huckwagons mountain bike shuttle trailers offer an elegant and environmentally friendly solution for hauling a quiver of bikes while still maintaining the camaraderie of the shuttle and road trip scene. Friends, family, and clients stay in the rig while bikes and gear are transported outside, damage free. Huckwagons. A shuttle trailer. For bikes. We’re happy to answer any questions that you have and look forward to getting the perfect Huckwagons bike trailer started for you.